Despite the wild ride of oil prices in 2018—in which gains earlier in the year were wiped out in massive sell-offs in the fourth quarter—energy and banking professionals expect Brent Crude oil prices not to deviate too much from current levels in the next five years. The median forecast of more than 1,000 energy market professionals surveyed earlier this month expects oil prices to average between $65 and $70 a barrel in the years 2019 through 2023, the annual Reuters survey showed. For this year, the highest number of energy industry, banking, hedge fund, and physical commodities professionals, among others, expect Brent Crude prices to average $65 a barrel, unchanged from the surveys of the past three years. The over 1,000 survey respondents, 26 percent of whom are directly involved in oil and gas production, see Brent averaging $65 in 2020, too, although $70 oil is a very close second call, according to the ‘Oil price outlook survey 2019-2023’ results compiled by Reuters market analyst John Kemp. In 2021 through 2023, the average Brent price is expected at $70 a barrel. Compared to the surveys from previous years, far fewer energy professionals believe that oil prices will return to triple-digit territory in the short to medium term. Record high U.S. crude oil production has somewhat abated concerns that a supply crunch is coming in the early 2020s because of the underinvestment in conventional oil during and after the 2014-2015 oil price crash. In this year’s survey, the average price projection for 2023 is $70 and most of the responses ranged between $60 and $80. This forecast suggests that fewer energy professionals now fear that there will not be enough oil supply on the market over the next five years. As a whole, the energy professionals surveyed by Reuters expect Brent Crude prices will not deviate too much from the current $60 a barrel over the next five years, averaging $65 in 2019 and 2020, and $70 between 2021 and 2023. For 2019, investment banks have oil price forecasts similar to the results in the Reuters survey. After the price slump in the fourth quarter of 2018, Wall Street’s major investment banks revised down their projections, but most of them predict prices in 2019 at between $60 and $72.60 a barrel. WTI Crude price forecasts for this year range from $49 at Citi to $66.40 at JP Morgan Chase, with most estimates falling in the $55-66 range. Most recently, Goldman Sachs slashed its Brent price forecast to average US$62.50 a barrel this year, down from an earlier projection of US$70, due to abundant supply. WTI will average US$55.50 a barrel in 2019, compared with an earlier estimate of US$64.50 a barrel, according to Goldman Sachs. Bank of America Merrill Lynch kept its $70 price forecast for Brent this year, expecting OPEC+ cuts to reverse the oversupply from the fourth quarter of 2018 into a “slight deficit” in 2019. BofAML, however, cited one key uncertainty about oil prices this year—a slowdown in global economic growth to 2 percent from 3.5 percent could result in Brent plummeting to as low as $35 a barrel. 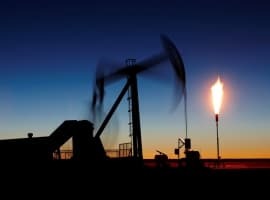 While in the base-case scenario, energy professionals and investment banks don’t see 2019 oil prices deviating too much from current levels, they warn that the key bearish concern in the oil market over the past few months—a possible global growth slowdown—could put downward pressure on the price of oil. Can The U.S. Keep Its Nuclear Industry Afloat? Can Mozambique Avoid The ‘Resource Curse’? I agree whith you, but always is necessary to study the big change in the world policy, in addition the new investment are in areas where the explotation is not easy (difficult weather, down populations, heavy oil, offshore, country policy, etc..) Triple-Digits is possible only 2020 or after. This is the oil and gas industry, Never say Never.